With 261 different telecentric lenses, Machine Vision Store offers one of the largest catalogs on earth. We have a great solution for nearly any project imaginable. About half our lenses are shown online. Certainly contact us for information about additional models. Image magnification is constant throughout a lens’s depth of field and across its field of view. The size of an object in the image will not depend on its distance from the lens, nor its position within the field. Perspective error is virtually eliminated. If an object is presented square to the lens’s optical axis, only the object’s front surfaces are imaged. The camera will not image the interior and exterior side surfaces of the object. The top image at right was captured using a normal (entocentric) lens. Notice the curvature of the bolt near the top of the image. The interior of the spline is imaged with obvious perspective error, making automated inspection more challenging. The bottom image was captured using a telecentric lens. When do I need a telecentric lens? Most images can be improved with the use of a telecentric lens. That said, the front of a telecentric lens must be at least as large as the object being imaged, so some lenses are quite large. How do I choose a telecentric lens? Selection of a telecentric lens is straightforward. Determine the necessary magnification factor by dividing the sensor area-of-interest ("AOI") by the desired field of view. For example, let's assume you're using an 8 mm diagonal (1/2 size) sensor, and that your AOI is the entire sensor surface. The 6.40 mm wide AOI imaging a 25 mm wide field of view requires a magnification factor of 0.256. The magnification factor will be the same in both x and y so, assuming a 4:3 sensor aspect ratio, the resulting field of view height will be 25 x 3 / 4, or 18.75 mm. Typically you will want a lens having an image circle at least as large as the diagonal of your sensor's area of interest ("AOI"). The exception is when imaging a circular or oval shaped object and you can tolerate some vignetting in the image corners. Note the AOI may be smaller than the full sensor size, assuming the AOI is centered on the sensor. Continuing the above example, the lens needs to have an image circle of at least 8.0 mm. Choose a lens having the same mount as the camera. A C-mount camera requires a C-mount lens. Verify the chosen lens's depth of field and working distance are appropriate. We can increase the depth of field of most lenses in our catalog by installing a smaller lens aperture. However, use of a smaller aperture will require brighter illumination, and slightly diminish overall lens performance. 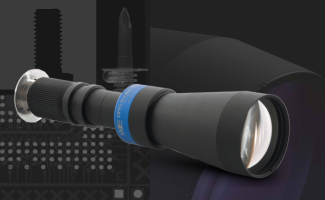 Verify the lens performance is matched to the pixel size and project requirements. Smaller pixels demand more performance from the lens. If the lens you’re considering doesn’t have MTF curves published on our site, they are available on request. With so many possible combinations of cameras and lenses, choosing the best combination can be a bit daunting. We’d be happy to recommend the ideal system for your needs. The easiest way to select a telecentric lens is to first select a camera from our catalog. Each camera's product page has a link for choosing a telecentric lens on its Resources tab. Follow the link to a calculator specific to your camera. Or, if you have your camera's specifications, go directly to our Telecentric Calculator. How do I optimize the performance of a telecentric lens? Carefully align the lens’s optical axis with the object being imaged. Allowing the object to rotate (on any axis other than the optical axis) will introduce perspective and measurement error. Use the spacer rings included with each lens to optimize lens performance. These spacers are used to correct for each camera's mechanical tolerances. Purchase or fabricate a lens holder for all but the smallest lenses. Lenses can weigh far more than the camera attached to them. 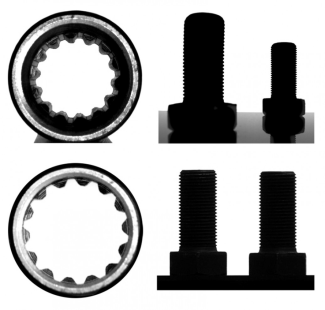 Ensure they are rigidly held in position, without inducing mechanical stresses. The telecentric lenses we offer have extremely low distortion, typically less than 0.10%. Nonetheless, you’ll achieve better measurement accuracy if you use a precision calibration grid to calibrate your imaging software. Consider a telecentric light source for crisp edges in the image. These are especially beneficial when imaging objects like cylinders and spheres that can bounce light around their edges. Ordered by optical format, then magnification. Contact us for information on many additional models.